Sal Khan is a teacher and the founder of Khan Academy, a nonprofit with a mission to provide a free world-class education for anyone, anywhere. 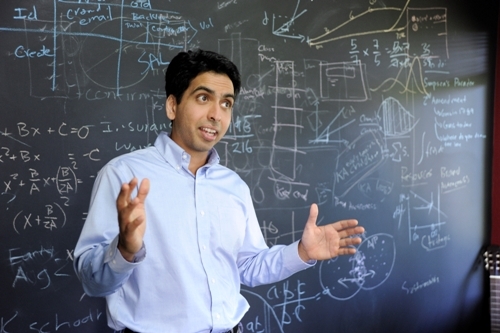 Khan Academy provides FREE online resources for learners of all ages. Khan received his Bachelor of Science degrees in mathematics, electrical engineering, and computer science from the Massachusetts Institute of Technology and then received a Master of Science in electrical engineering and computer science. Khan also holds a Master of Business Administration from Harvard Business School. Khan Academy provides over 6500 instructional videos about all sorts of subjects such as algebra, biology, physics, chemistry, and even art history that are FREE to anyone, anywhere. But Khan Academy is much more than a collection of videos. Khan Academy provides interactive exercises with unlimited practice and feedback for each participant. Teachers also have diagnostic tools to assess what students have mastered and what areas need more mentoring time. Khan Academy’s coaching feature allows teachers to connect directly with students and monitor their progress. The Khan Academy team has 80 full-time employees and many volunteers who reach 26 million registered students. Khan Academy’s resources are used to augment classroom education at the student’s own pace and time, allowing teachers to spend more time doing experiments and richer projects. 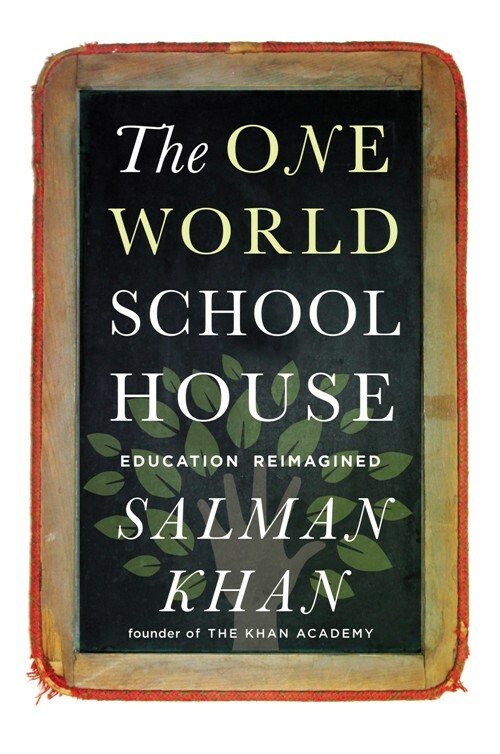 Khan has published a book titled The One World Schoolhouse: Education Reimagined about Khan Academy and education goals. Special thanks to Sal Khan for taking the time to share his thoughts, educational insights and vision for the future of education. We are grateful for the opportunity to share this exclusive Amazing Kids! 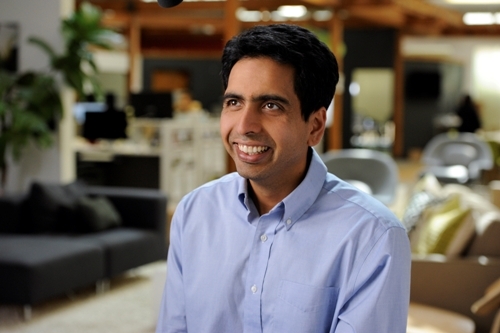 interview with Sal Khan with our readers. Amazing Kids (AK): Mr. Khan, we know you worked as a hedge fund analyst before starting Khan Academy. For our younger readers, a simplified description of a hedge fund is that it is an investment vehicle that pools money from a number of investors and invests in securities and other instruments. Changing from being an analyst to being an educator might, for some people, be considered a major change. How did following your passion lead you to founding Khan Academy? Sal Khan (SK): Before being an analyst at a hedge fund (as you mentioned, a hedge fund really is just a fancy word for an investment fund) my background was in math, science, and engineering and my previous career was as an engineer, working in tech. So I had a background in some of these domains. But what a lot of people don’t appreciate is that working at a hedge fund is about understanding a lot of different industries. In a given day I might have talked to one company that was building software, one company that was developing some type of drug, and one company that was building a railroad. So, in a very strange way, I had to learn a lot about how the world worked very quickly and draw connections—and also synthesize and explain what I’d learned to the other people on our team, including my boss, who was my portfolio manager. So, when Khan Academy started off as a hobby, in a lot of ways it felt like I was using very similar muscles. For many years I was working on Khan Academy and at the hedge fund simultaneously. I was very lucky. In a lot of the finance world, and a lot of the world in general, people work very long hours (80 hours a week) so they have very little time to pursue their passion. But I had a boss who told me, “Look. While we’re at work, we should work hard. But our job isn’t about making a lot of decisions and just tiring ourselves out. Our job is about making good decisions. And the best way to make good decisions is to have a life – go home, energize, spend time with our families, and develop our passions.” So that gave me space to work with my cousins, tutoring them initially, and then eventually making software and videos that have now developed into Khan Academy. Therefore, my finance career had an unexpected connection to what I do now. And I was lucky to have a boss who believed in the value of pursuing your passions, and that this pursuit actually makes you a better investor. AK: Did you have an “ah ha” moment when you knew this was the direction you wanted to take your life? SK: I always had a sense, even at a young age, that there was a better way to learn a lot about math or science – really all subjects. In middle school and high school, I had my friends who could beat me at chess, who could learn a video game faster than I could, but who were struggling with algebra or trigonometry or physics. It was obvious to me that the problem wasn’t that they didn’t have what it took; the problem was the way the material was delivered to them. It wasn’t intuitive. If they had some gaps in their understanding, it was hard for them to address these. The teacher had to address all 30 students at the same time, so some of the students might have been bored, while others might have been a little bit lost. So, I always had a sense that there might be a better way, and I kept thinking about this is college. So 11 years ago, when my 12-year-old cousin, Nadia, said that she was having trouble with unit conversion and was being placed into a slower math track for that reason, I took tutoring her as a chance to test some of my ideas, while hopefully helping Nadia too. After just a month or two of just ½ hour to an hour a day on the phone with her, she was able to catch up, and even get a little ahead of her class and switch to the advanced math class. That seemed to validate some of these beliefs that I had had since I was quite young. So I said, let me try this out with her brother, and it also seemed to resonate with him. Word got around the family that free tutoring was going on, and I found myself tutoring a lot of cousins. Even at this point—when there was no Khan Academy website yet—I realized that there was something here. There are kids that are able to understand math or science at a much higher level than we might at first think they are capable of. So I started working on the software for Khan Academy and then the videos. And the videos were interesting. I told my cousins, “Watch these, and then we can get on the phone and you can ask deeper questions.” And they famously said that they liked me better on YouTube than they did in person. But what they were really saying was this: when you’re learning something the first time, it’s actually stressful to have your cousin on the phone. Even if he is trying not to be judgmental, it’s much easier to learn the basics from a video because there’s no judgment. You can watch the video as many times as you want, and there’s no shame if you have to review something that you might have forgotten from a couple of years ago. The videos were public on YouTube, and comments started to come in. I noticed that many comments came in from people that I had never met and were clearly not in my family. The comments were things like, “These videos allowed me to pass Algebra class.” Or “These videos are the reason why I am able to go back to college.” Or “These videos are the reason why I want to be a physics major.” That’s when I said, “Wow, there’s something here” because a lot of these comments weren’t coming from your traditional honor student who might be motivated to do a lot of studying. A lot of these comments were coming from kids who thought they were bad at math – kids who were about to disengage. But if they could just get the concepts explained the right way or get some intuition, this would make all the difference in the world for them. At that time, in 2007, there weren’t that many people using Khan Academy. But the people who were using it were sending these incredibly grateful comments. I wondered, What if more people know about Khan Academy? Over the next few months, usage kept growing, and I thought, Wow, this is exponential growth. If this keeps up for a few years, we could help hundreds of thousands, or millions, or maybe one day hundreds of millions of people. By 2009, I frankly had trouble focusing on my day job, so I incorporated Khan Academy as a nonprofit. There are so many philanthropists that want to support education, and this felt like a way to do that with a lot of scale and a lot of impact. At that time, there were about 100,000 people using Khan Academy, and now there are up to 14 million every month. AK: What values (or useful skills) from your childhood have you applied to the creation of Khan Academy? SK: I’m a very visual person. When I was growing up, I wanted to be an artist, or a cartoonist, or an architect, or a designer of some kind. Even when I found myself in high school and college studying, I would always draw diagrams. I always felt that if I couldn’t distill a concept to a simple diagram in my mind, then I really didn’t understand it. And so I think those ideas—that you really don’t understand something until you can simplify it (regardless of how intimidating it might look initially), and that if you view any concept in the right way, it can actually be quite intuitive—had a big impact on Khan Academy. The idea that you can visualize concepts helped me when I was thinking about Khan Academy too. I was also in a family that could be quite argumentative, and I think that helped build my communication skills. Argumentativeness can have its limits and its extremes, but there is a benefit to arguing, in that you build that part of your brain that can take an idea in your head, visualize it, and then communicate it verbally. AK: Describe the mission of Khan Academy and where you stand today on achieving your mission. SK: We are a not-for-profit with a mission of providing a free world-class education for anyone, anywhere. And, as I joke, it is not like we are going to check off that goal this weekend and move onto health care or something. In our mind, this mission is something we are pursuing right now as vigorously as we can, and we are going to continue to pursue it for 10, 20, 50, maybe even 100 years. Our goal is to build an institution for the world that is multi-generational. That is one of the reasons that we established ourselves as a not-for-profit. And part of our mission is to make content in all of the areas that are core to people’s academic and life progress. So, right now, we focus especially on the things that block people from progressing. There’s a lot of math, a lot of science, but we’re starting to do a lot of humanities as well. And not just videos – we have exercises and articles too. We want to make it all accessible to the whole world – for anyone, anywhere – so we are translating or localizing all of our content (not just the videos, but also the software and articles) into other languages. Khan Academy has already been fully translated into Spanish, Brazilian Portuguese, Turkish, French – and we want to cover all of the world’s major languages. We want to build our high-depth experiences – where students can go and pick a subject and grade level and then learn at their own pace, and where we’ll diagnose what you know and what you don’t know yet, and give you unlimited practice to progress. There are all sorts of game mechanics on Khan Academy. We want to help people with things like the SAT. We are the official practice tool for the new SAT coming in March 2016, and we’ve worked on some fairly sophisticated software for that. So that’s kind of the content we want to create going forward. In terms of scale, we’re reaching up to 14 million students per month. But we want that to grow by a factor of 10 or 100, so that when you fast forward 10 or 15 years, we’re reaching 100 million to a billion students per month, in every major language and in all the topics that matter to them. On top of that, we hope to partner with other institutions to create programs that help motivate more people to leverage tools like Khan Academy. A tool is only as good as how it is used. So we want to get more people to deeply engage with tools like Khan Academy. AK: From your first tutorials for your cousin on a Doodle Thinkpad to where Khan Academy is today, the scope of your direction has changed dramatically. Was this something that you envisioned early on, or did this evolve through concerted strategy sessions with your team? SK: A little bit of both. You know, I definitely read a lot of science fiction. One of the book series that most inspired me was the Foundation series by Isaac Asimov. I first read it around middle school. The book takes place 30,000 years in the future—humanity has colonized the entire galaxy and there’s a galactic empire. There’s this guy, Hari Seldon, who’s kind of an economist/mathematician. He can’t predict what one individual is going to do, but through his science, he can predict what large-scale, historic movements will occur. He is able to see that the galactic empire, which looks like it’s in its heyday, is actually 300 years from a Dark Age, and he is able to predict that the Dark Age will be roughly 10,000 years long. So he wants to shorten the Dark Age. He creates this foundation on a remote planet that protects the galactic empire’s knowledge so that they can spread this knowledge to shorten the Dark Age when it hits. And when I read that, I remember thinking, Well, this is inspiring! This is epic! How come no one in our current day seems to think on these scales? In the early days, when people were starting to benefit from Khan Academy, I immediately remembered the Foundation and Isaac Asimov. I thought, Well, gee, it seems kind of delusional when I’m working out of a walk-in closet, but maybe Khan Academy could be an institution that helps a large number of people become truly empowered. So we’ve kind of operated on that idea. And as we’ve grown and built our team and added more resources, that delusion is starting to feel a lot less delusional. AK: You have set about building a “brand” for Khan Academy. Can you describe to our younger readers what this means and how it is important to your mission? SK: Brand is what people imagine when they think about your organization. When I started Khan Academy, I wasn’t thinking in terms of brand. I wasn’t even thinking of Khan Academy in terms of an organization; I thought it was a hobby. But it was clear that Khan Academy was building a sense of trust, of approachability, with users. They started to feel that if they had trouble understanding something anywhere else, they could come to Khan Academy, and then they’d be able to understand it. And the material would be delivered to them in a way that was respectful and didn’t make them feel frustrated or judged. I think that trust is core to our brand. As we grow, it is important that we maintain those essentials of what Khan Academy is: approachable, substantive, helpful, insightful, funny at times, hopefully a little bit eccentric, but always personal. It feels like something you can connect with. It feels like we’re your cousins, so to speak. AK: Khan Academy is a nonprofit 501(c)(3) corporation. Why did you decide to be a nonprofit when you could have very easily made a lot of money doing what you do? SK: In my day job, I invested in public companies, and to a large degree I would study what the incentives of public companies were. A lot of public companies—a lot of for-profit companies—do good work and create great products, but they are beholden to the investors. Sometimes the investors will allow them to make good long-term investments. But sometimes these companies have to do things for the next quarter, for the next year, very short term. And there are very few for-profit companies that are able to stay focused on a mission for multiple generations. The only organizations that have remained focused on their mission have been not-for-profit institutions – like the great universities, museums, and libraries. So when I was in a walk-in closet, I thought, What if Khan Academy could be an institution that could reach students, not just over my lifetime, but over many lifetimes? How do you do that? Well, set it up as a not-for-profit so that the mission, not a profit motive, is its bottom line, and see if we can reach as many people as possible. I also wanted to make sure there would not be an ulterior motive, and for people to understand that there is not an ulterior motive, because that helps build trust as well. It is definitely more about trying to build an institution than building a company. AK: How did you find your supporters and how do you maintain a steady stream of money to keep the core operations running? SK: The answers weren’t obvious 5 or 6 years ago, and they’re still evolving. I had a hunch that the social impact that Khan Academy could produce was really off the charts. The social return on investment was big. So I thought to myself, There are so many people who are philanthropists in education who want to make a social impact. If they realize the leverage, the scale they can produce through Khan Academy, hopefully they will fund it. I quit my job with that assumption. My family was living off savings. It was actually quite stressful, and it took longer than I expected for the mission to resonate with people. But eventually, by spring of 2010, summer of 2010, the mission resonated with several very important folks. And they gave us the funding to become a real organization, get office space, and start hiring a team. Since then, as we’ve grown in scale and been able to articulate our message more clearly, I think more philanthropists are seeing the social return. And I want to be clear, philanthropists aren’t just people who are very wealthy. We get a lot of donations ($5 or $10 donations) from parents, teachers, and students all over the world. Some benefited from Khan Academy themselves, and others had a family member who benefited. So those donations continue to be the bulk of our resources. Like any organization, we have to make sure that we are able to sustain our impact, so that we can make the case that we can continue to fulfill our mission. AK: Your tutorials use self-paced learning. You’ve added some motivational techniques onto your website to push students to complete the tutorials, like badges. Can you describe these motivational techniques and how you vary them by age group? SK: You’re right. We have game mechanics and we’re always trying new things to see how we can motivate students even more. A lot of the motivation features, including badges, are actually very similar across age levels. I think we could differentiate what a college student experiences from what a first grader experiences a little bit more, but at the same time we have a core belief that all people should be treated with respect, as fun, curious and intelligent people. A college student might not mind a little bit of fun and whimsy. And a first grader likes to be treated as someone who is capable of learning and has independence. So we try to keep the tone fairly consistent across age groups. But we’re always experimenting with new things, game mechanics, and motivational techniques – making minor tweaks to the site and showing them to 10-20% of our users and then seeing if these tweaks bring them back to the site. We’re always looking for ways to work with teachers and create programs so that more people want to engage and move up the learning curve. AK: Describe what you think a classroom in 2025 will look like? SK: In 2025 I think you’re still going to have some classrooms that look like they do today, but I’m hoping that what will be more mainstream, and even viewed as the best practice, is providing lectures and exercises that are available at a student’s own time and pace, anytime, anywhere, and a learning program that progresses with them, using adaptive software. I think that in 2025 you’re definitely not going to have textbooks any more. All of that is going to be available online. Textbooks explain things to you while new resources like Khan Academy give you videos, articles, interactive exercises with feedback and explanations, and more—offering much more than textbooks. So I think textbooks are going to go away. And since explanations will be available at your own time and pace, lectures won’t be the focal point of classrooms anymore. Instead the focus will be simulations, dialogue and group projects. So I don’t think the classroom will go away, but it will focus on higher-order tasks, rather than just lecturing. AK: What are the first steps to building an educational system with online courses and mentors in the classroom? SK: The first step is to make the resources available. Khan Academy is working on this, and there are other folks who are part of that puzzle. There are already classrooms starting to do it. Another big step is to move to what we often call a competency-based model, where instead of dictating how long you sit in a chair, schools specify what you should master or show proficiency in. A traditional class might allocate 3 weeks to learning exponents, which might be too little for some students and too much for other students. Under the competency-based model, if it takes you 3 days to learn exponents, great – you can learn that concept, master it, and move on. If it takes me 3 months, I should take those 3 months, because if I take only 3 weeks and don’t learn exponents well, that gap in my knowledge will be debilitating when I try to learn logarithms, or negative exponents, or more advanced algebra, or whatever else. We’re already starting to see this happening in pockets in very forward-thinking classrooms. But I think as you go into 2025, this model will be more and more mainstream. We even have a lab school that we opened downstairs from our office to test some of these ideas – mixed-age classrooms, personalized learning, full-year/full-day schedules, and a focus on project-based learning. Here, instead of being a lone lecturer in a room, the teachers teach as a group, co-teaching the entire cohort. AK: Besides global expansion, what is next? AP Tests? Language courses? SK: One focus area is internationalization. We’re not teaching languages, but we are making our content available in other languages. We’re not teaching people how to speak Spanish, but you can now learn algebra in Spanish. Another big focus is to expand to different platforms, like Android and iOS phones and tablets. We’re also expanding our content. We’ve always had a lot of content in physics, biology, chemistry, and history, but now we’re making sure that it is really comprehensive, adding exercises and articles. That’s a focus in all the core subject areas. AK: Are you ever planning on having your own school in the future, like a Khan Academy in the physical sense as well as the electronic sense? SK: As I mentioned, we actually started a lab school, downstairs from our offices, 9 months ago. My oldest child, my 6-year-old son, goes there. He started last year when he was 5 for kindergarten. The lab school does all the things I’ve talked about in this interview and in my book The One World Schoolhouse. The last third of the book covers what the school of the future is all about and I encourage you all to read it. You’ll probably find it interesting. Khan Lab School uses personalized learning and blended tools for core skills so that class time is freed up for more project-based learning. The curriculum doesn’t separate subjects the way traditional schools do, so there could be a project that involves math and writing and science and art. It is a mixed-age environment, so students ages 5 – 13 are all learning together. For students, there is a lot of peer-to-peer learning and mentorship going on. It is a full-year program, so there is no summer vacation. But the kids don’t want to leave because they are able to pursue their passions and work on things at their own pace. It’s also a full-day program – school goes until 6:00. The whole goal is to test these ideas and see how these things can work. Then we can share these ideas with other people so that, regarding the question about 2025, more changes can happen. AK: How is the SAT program working out for you? What feedback have you received from students? SK: We just launched it in June, and it is for the new SAT coming in March 2016. We’ve already had hundreds of thousands of kids use it, but I think it is going to get much heavier usage as we go into the back-to-school season and especially as we approach early 2016. The early feedback is very positive. Before, a lot of students felt like they had to take these fancy test prep classes, but now they see that the software is more advanced than they thought it was. We’re giving it to them free. The practice questions are actually created in conjunction with the College Board specifically for the SAT, so they’re much higher quality and more realistic than what you’d get in traditional test prep. We’re excited about the possibilities. AK: Many people believe that your involvement in giving free SAT prep levels the playing field so that every kid has the proper opportunity to do well without having to pay a lot for private coaching classes. How do you encourage this opportunity? SK: We need to get a lot of people to know about our practice tools. We’re also partnering with folks, like the Boys & Girls Clubs of America, to make sure that the students who need this resource the most know that it’s available and that they have ways to access it. AK: Going forward, what is your biggest challenge? SK: Our biggest challenge is that as we grow our scale, and as we try to maximize our impact and empower as many people as we can, we must not lose the essence of what makes us, us – our soul. We must make sure that we continue to connect with students – that we’re approachable, whimsical, and funny. We can’t be afraid to take risks or afraid of failure. That’s the biggest challenge.